An LSBU Research Office lunch in 1998 sparked a conversation between Acoustics specialist Professor Bridget Shield and psychology professor Julie Dockrell. 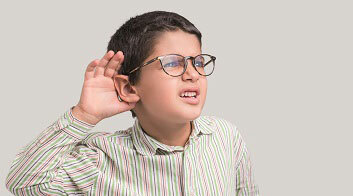 A few days later a Department of Health (DoH) call for research proposals led to a joint bid to study the effects of noise on children in London primary schools. Professors Shield and Dockrell were awarded a two-year research grant by the DoH. After Professor Dockrell moved to the Institute of Education (IoE) in 2001 they were awarded further funding by the Engineering and Physical Sciences Research Council (EPSRC), including two large collaborative research grants, to look at the effects of noise and acoustics of classroom design in primary and secondary schools around the country. A key driver of our work has been concern that poor classroom acoustics impede pupils’ ability to learn, affect their academic performance, cause annoyance to pupils and teachers and affect teachers’ health. The research has provided us with results that have been used to guide the development and revision of regulations concerning the acoustic design of schools. “A key driver of our work has been the concern that poor classroom acoustics impede pupils’ ability to learn, affect their academic performance, cause annoyance to pupils and teachers and affect teachers’ health. The research has provided us with results that have been used to guide the development and revision of regulations concerning the acoustic design of schools,” says Professor Shield, Emerita Professor in the School of Built Environment and Architecture. The continuing collaboration between LSBU and the Institute of Education established the research team as world leaders in the acoustics of classroom design. In 2009 they invited Professor Trevor Cox of the University of Salford to join the team in a three-way project on secondary schools, funded by the EPSRC. They also supervised a highly successful PhD project on open-plan classroom design. “Key to the success of our research on this theme has been the engagement of multiple stakeholders,” adds Professor Shield. “For example, in 2000 the Department for Education and Skills decided that schools should come under the same building regulations as dwellings and so I was approached to edit Building Bulletin 93 – Acoustic Design of Schools (BB93), which contained the required acoustic specifications and guidance on how to achieve them." “The core of our research has entailed coupling the disciplines of psychology and acoustics. External and internal noise measurements were taken in schools, together with acoustic surveys of classrooms, whilst psychology-based studies were conducted of pupils’ and teachers’ perceptions of their acoustic environment, and of pupils’ performance in different tasks. Results from the project on secondary schools are still being analysed and published but, following the findings on teachers’ voices, Professor Shield has liaised with organisations such as the Voice Care Network and the Nordic Voice Economic Group in publicising data on teachers’ voice problems and the influence of the acoustic design. Related to this, Professor Shield and long-term colleague Dr Stephen Dance, Reader in Acoustics at LSBU and another internationally recognised expert in acoustics research, are currently supervising a PhD project on the teacher’s voice. Perhaps the biggest impact of the research has been in safeguarding BB93, which was at risk, in 2010, of being dropped as part of the government’s mission to reduce the burden of regulation relating to school building. Professor Shield set up a lobbying group, involving stakeholders such as the Institute of Acoustics and the Association of Noise Consultants, which, together with the National Deaf Children’s Society, successfully secured the retention of building regulations for schools plus the endangered acoustics regulation in the School Premises Regulations, which cover school infrastructure. A central element of the success of this lobbying was the cost-benefit analysis that Professor Shield conducted on classroom acoustics. Meeting several politicians, she provided information from the research showing the impact of poor acoustics on pupils. The research has revealed that children’s academic performance declines with increased noise in classrooms in both primary and secondary schools. The sharpest decline in performance is seen in children with additional learning needs. Professor Shield has played a pivotal role in the development and the recent revision of Building Bulletin 93 – Acoustic Design of Schools. The revised form of BB93 is more stringent: it applies to both new-build and existing schools, and includes recommendations relating to open-plan classrooms developed during the PhD project by Dr Emma Greenland, supervised by Professor Shield. Teachers are at risk of voice damage due to high noise levels in classrooms. Professor Shield received two awards in 2011 for her work: the Institute of Acoustics RWB Stephens medal, awarded for outstanding achievement in teaching and/or research; plus a Noise Abatement Society lifetime achievement award. In 2014 Professor Shield was elected as a Fellow of the Acoustical Society of America in recognition of her classroom acoustics work.